This recording takes you to California's Sierra Nevada, to an ancient grove of Sequoias, the most massive trees on earth. Imagine walking around this peaceful place. It is difficult to grasp the size of the forest giants around you. They tower above, reaching for the sky with cinnamon-coloured trunks, often dotted with woodpecker holes. Pausing to listen, you hear small birds such as Nuthatches, Flycatchers, Brown Creepers, Kinglets, Warblers and Fox Sparrows sing from high in the canopy or among low shrubs on the forest floor. 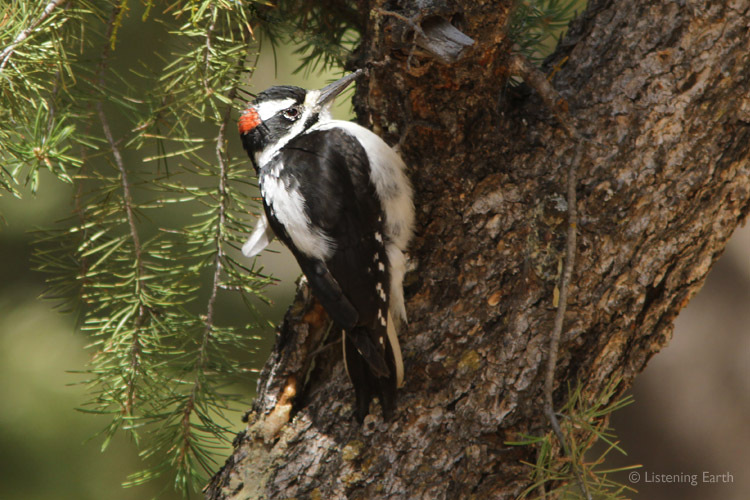 The drumming of woodpeckers large and small resounds through the forest. This place must be Woodpecker Heaven! As you meander around the Sequoia grove, you hear other sounds: the piping of a Pygmy-Owl, a Mountain Quail, and the chatter of small mammals; Squirrels and Chipmunks. A party of Stellar's Jays move through, and the dark shape of a Raven swoops overhead on languid wingbeats. Giant Sequoias are certainly a wonder to see, but this grove is a beautiful place for listening too. Sequoias are found in a limited altitudinal zone in California's Sierra Nevada. They have endured logging for fenceposts, celebrity status, and the ravages of Los Angeles' air pollution. However scientists are now concerned that declining rain and snowfall due to climate change may pose a greater threat to their long-term survival. As massive and enduring as Sequoias are, they may be more vulnerable to small changes than we imagine. 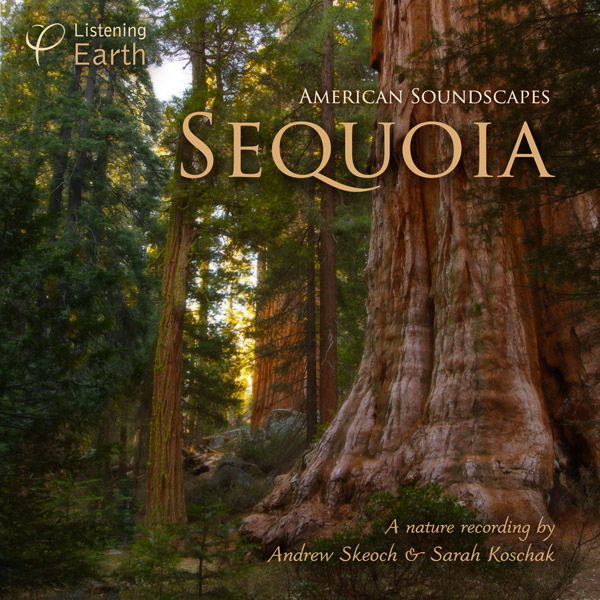 Andrew made this recording with two sets of microphones, moving them occasionally to capture different areas of the Sequoia grove. The final album tracks are drawn from four of these recordings, each presenting a different scene. It is as if you are walking through the forest, passing from one group of bird territories to another, pausing every now and then to listen and take it all in. Once again, our heartleft thanks to ace-wonder-biologist and birdsong identifier Lauren Harter for her assistance in the preparation of listening notes for this album.